Going to one of those dreadful family reunions that are extremely awkward and really need to be spiced up? Pick our plastic envelopes to make at least one interesting conversation starter with your third cousin twice removed. Instead of hearing how grown up you look, you'll be hearing how "hip" you are from your great aunt, or how "on fleek" you are from that random teenager you don't remember belongs to who. These stylish purple plastic envelopes that are perfect for those 4 x 6 photos and can hopefully remind you who that teenager is, but also make your parents cry with all of the sweet memories they think you remember when you were about ... two years old. At your next reunion five years later, we bet your family will still be asking about that purple envelope you came with. Try out another of our JAM plastic envelopes to keep them on their toes. Being remembered for our bright envelopes is better than not being remembered at all right? Purple A6 Plastic Envelopes measure 4 1/4 x 6 1/4. 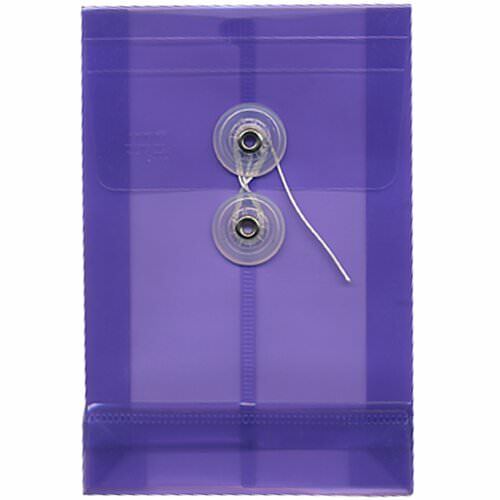 The poly a6 plastic envelopes are available in Lilac and Magenta with String Tie Closure.